A recurring theme in the media and in public debates is the promotion of equality. 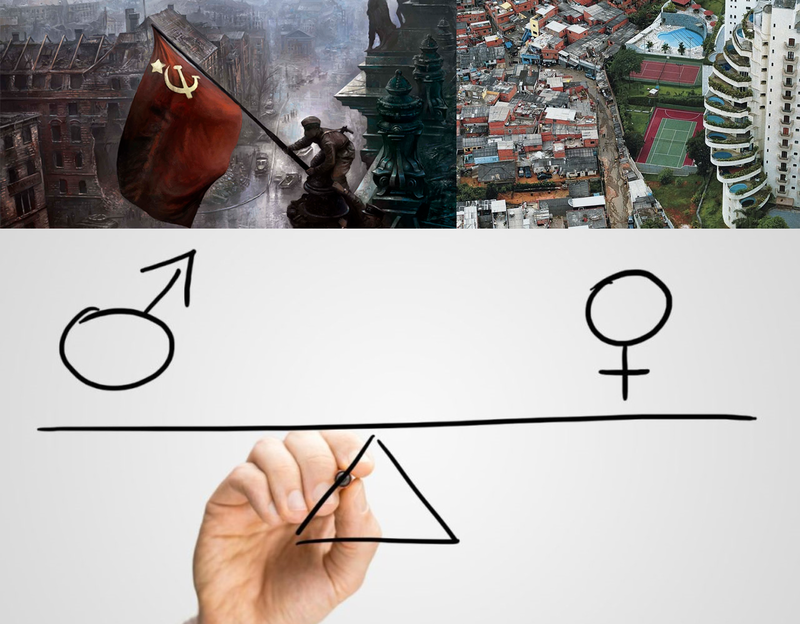 This "egalitarianism", strongly related to "left-wing" ideology, is constantly used as a foundation of studies, actions, and policies in the most varied areas such as economic, racial and gender. At the core of such measures lies the belief that reducing many of the existing inequalities in society will lead us to a better world. The present article aims to expose a fatal logical flaw present in egalitarian reasoning and then concluding with reflections on the impacts of this flaw on political philosophy. In the most different fields of human knowledge, many ideas and groups of ideas came to be elaborated. In their defenses, arguments are often employed, these being instances of reasoning composed of statements[R1] where one, the conclusion, is desirably supported by the others, the premises, by means of a structure that consists in the way such affirmations are arranged[R2]. Arguments are not always good: they may fail to provide due support for rational belief in their conclusions. Such failure can be the result of problems in the veracity of the premises, in the reasoning's structure, or both at the same time[R2]. In the second case, there is a problem of logical nature and such a mistake is often called "logical fallacy". Thus, an argument is "logically fallacious" if it presents a flaw in its structure that makes it unfeasible as an adequate means of demonstrating the truth of its conclusion[R3]. Recognizing the presence of a structural error in a reasoning or of a new kind of fallacy usually involves the simple use of rational intuition. Normally it is up to the analyzer to recognize, just by contemplating the argument, that it is not logically valid. For that reason, some of the proposals for new types of fallacies consisted of mere mentions of them. Thus it was when C. S. Lewis proposed the Bulverism[R4] and Antony Flew, the "not a true Scotsman"[R5]. In certain cases, however, it is possible to demonstrate that a given line of reasoning is fallacious. An example of the viability of demonstration concerns the various configurations of the so-called non sequitur, the case in which the conclusion simply does not follow logically from the premises when a deductive reasoning is intended[N1]. In this case, it is possible to demonstrate the presence of a non sequitur presenting at least one situation in which the proposed reasoning structure is present without the conclusion being correct. For example, the fallacy argumentum ad Nazium (or reductio ad Hitlerum) consists in saying that something is bad because Hitler or Nazism defended it[R6]. As the method suggests, this line of reasoning is shown to be false by contemplating at least one good or at least not bad thing Hitler or Nazism advocated, such as being a vegetarian or the progress of a nation. Once it is true that being a vegetarian is not evil or bad and yet the Führer practiced it[R7], it is shown that the mere fact Hitler has defended something does not imply that it is bad. The same goes for the case of the progress of a nation defended by the Nazi vision. The "appeal to nature" provides another example. This fallacy consists in affirming that something is good or right by the simple fact of being natural, or bad or wrong if it is not natural[R8]. Such reasoning is shown to be logically invalid when it is envisaged, for example, that an industrialized pasta is not bad for human health, even being better for it than feeding on poisonous plants and animals although they are natural. Examples like those presented above demonstrate the validity of this method for non sequitur recognition. Consequently, and according to what has been discussed previously, once a similar assessment has been made on some argument, the correct action will be to abandon it, thus avoiding a belief with a rationally invalidated justification. This, however, is not the same as and does not imply the need to abandon belief: a structurally invalid argument does not imply its conclusion to be false, but only that it is not an adequate justification for believing in its conclusion. It is possible that an argument fails logically while its conclusion is true and demonstrable by another line of reasoning[N2]. In some cases, however, the death of an argument implies the defeat, even if temporary, of its conclusion. This occurs both with propositions that have their support in a single argument[N3] and with those that are intrinsically related to it. In the latter case, the conclusion is rationally unacceptable because there is no way to be believed without asserting the fallacy. It is also important to recognize that, sometimes and depending on context, a line of thinking will be plausible despite employing a fallacy. A typical example is the "composition fallacy" when used to determine the color of a surface. This fallacy consists in affirming that a whole has a certain property because [all] its parts have that property[R9]. By employing the above method, it can be shown that this is not the case. For example, all parts of Da Vinci's Mona Lisa painting are misshapen stains while the painting, the whole, is not. On the other hand, it is plausible to conclude that the color of a tile surface will be green if all of its tiles are green. This reasoning seems plausible even though it is a case of the fallacy of composition. Although cases such as the surface coloring seem to demonstrate a certain "sporadic plausibility" of fallacious reasoning, this does not invalidate or even minimize its impracticality as a support for conclusions. In cases such as the tiles, it will still be necessary to provide some additional information to justify the relationship between the premises and the conclusion to justify the argument. This will come as an additional premise to the reasoning which, in turn, will inevitably result in the emergence of a second, more complex argument than the original one[N4]. When a line of reasoning is identified and appears with a certain frequency, it is common to be baptized with a name[R3] as was the case of the two examples of fallacies mentioned above. Taking this into consideration as well as the method recently presented to identify non-sequitur cases, I propose that a new, plausibly denominable fallacy "of equality" or "egalitarian" should be recognized. The line of reasoning contemplated is that according to which "if, in a certain situation, there is equality, then such a situation is good or better than it would have been if there were inequality". What is being affirmed is the existence of some relation of implication between equality and positive qualitative state of moral, aesthetic or any other nature (such as the present in "a good chess move"). Following the proposed method, it can be shown that such a line of reasoning is a non-sequitur form if there is at least one situation in which the implication relation between equality and positive qualitative state is not present - and such cases are abundant. For the first example, there is the issue of poverty. Faced with a reality of scarce resources, people may come to concentrate more or less of these resources getting more or less rich. Depending on the level one has, an individual may be unable to possess the minimum to meet their basic needs and live a materially pleasant life. As the opposite of this is desirable, one can conclude that the financial state of poverty is undesirable. On the other hand, the more abundant a person is, at least everything else equal, the better it will be for him. With this in view, one can imagine a hypothetical group of one hundred people where each one will be either poor or rich. In wishing to maximize well-being in line with what has been previously considered, one can conclude that the worst state in which such a group can be is that in which all one hundred individuals are poor, living in suffering. In contrast, the best possible state for this society is one in which all are rich, living in abundance. Consequently, an intermediate state where some have already attained wealth, but others still remain in poverty, will be inferior to full wealth, but better than full poverty. In this case, there are two possible states of equality (totally poor and totally rich) and one of inequality (only partially rich) being one egalitarian state bad (all poor) and one non-egalitarian state better than an egalitarian one (better some rich than all poor). This, however, is opposed to what declares the fallacy of equality: not only is there an egalitarian state that is not good, but there is one that is inferior to one with inequality. According to the method, therefore, it is thus shown that equality does not imply quality. A similar case is visible within the scope of justice. In a country with laws and where a portion of the population has suffered criminal offenses, there is the possibility that all of them will be wronged, of all receiving due justice and some receiving justice while others not. To the extent that it is desirable for an individual to receive the reward provided for by law in the face of a crime committed against him, it may be concluded that the worst case scenario is that all are wronged while the best possible situation is that in which all receive their due. Finally, there is still the possibility that some will receive justice while others will not. In this case, there are two egalitarian situations, one of which is not only bad, but the worst of the possibilities, and a situation of inequality that, although not ideal, is better than one with equality. Such an example also shows, therefore, that the mere fact of equality does not mean that something is good or better than it would be if there were inequality, thus proving that the inference in question is logically invalid. Based on the use of the proposed method for the detection of non-sequitur variants applied to the presented cases, it is concluded that inferring positive qualitative state from equality is logically invalid. The same, of course, proceeds with the inverse reasoning, inferring negativity from inequality. Although the presented examples demonstrate the fallacy of equality in accordance with the proposed method, it may be tempting to insist on affirming a connection between egalitarianism and a positive qualitative state in face of all the best situations being egalitarian ones. This relation, however, is nothing more than a coincidence, for what makes such states desirable is not their equality, but the abundant presence of what makes them good (be it wealth, justice, or something else). Its positive character, then, is not the merit of equality. The recognition of the egalitarian fallacy brings relevant implications for the intellectual sphere. This is because its line of reasoning is commonly employed in works and theses in various areas as justification for a wide variety of proposals and positions. Being a fallacy, such defenses are deficient and should be rejected. Also as it was seen, the theses or positions that have in the defense of equality their only argument should be rejected until a new, valid justification arises in their defense. Finally, theses that are inescapably connected with the egalitarian fallacy, being impossible to disassociate them from it, should be rejected. A notorious case of this latter implication lies in the ideological current called "left" or "leftism" as the following reasoning demonstrates. Ideologies, religions, philosophical currents and other forms of "packets of ideas" are characterized by defending one or more propositions. Such propositions are discriminable in "essential" or "fundamental" and "non-essential" or "superfluous". The fundamental ones are those necessary for the veracity and validity of the package; it is necessary that all be true for the group of ideas that propose them to be rationally acceptable. In the other hand, superfluous propositions, although they may be commonly defended, are disposable; its untruth does not imply the invalidity of the respective group of ideas. Consequently, to refute at least one essential proposition implies to forfeit the rational belief and acceptance in the packages that defend it. Yet to refute even all superfluous propositions does not change the status of rational acceptance of such packages. For example, Christianity defends a set of propositions organized in doctrines. Among these, some are essential such as the affirmation of the existence of God and the affirmation of the salvation of mankind from their sins through faith in Jesus of Nazareth. As fundamental pillars, the veracity of such ideas is necessary for the truthfulness of the religion: if at least one of these statements is false, then necessarily the religion is false even though all others may be true[N5]. The same does not proceed with propositions respective to peripheral doctrines such as biblical inerrancy. While it is common for Christians to defend it, theologians agree that Christianity would be far from proven false if such doctrine were invalidated[R10]. Thus, it is concluded that if a package of ideas presents an essential proposition whose only argument used for its support expresses a fallacy such as the egalitarian one, then this package is rationally unacceptable at least until a new and good argument is presented. It is also concluded that if an essential proposition inescapably asserts a fallacy, then the package of ideas that defend it is rationally unacceptable. One case in which this occurs is leftism. Although it can be defined in more than one way, leftist ideology is intrinsically connected to the idea of pursuing social equality[R11][R12] in economic, civil, and political terms. The fight for equality is a recurring theme in leftist works, and literature about them constantly unites them by presenting one in terms of the other. Thus, the quest for social equality, represented by the proposition "one must seek/defend/fight for social equality", is an essential constituent of the left. As for such a proposition, one can ask what is the reason for its truth, why should we seek/defend/fight for social equality. And a likely answer to be given by a defensor would involve obtaining a positive qualitative state, i.e., because somehow "this is/will be good"[N6]. Once that is the only reason for an individual to have that position, being it the fallacy of equality manifested, then he should stop defending it. In other words, an individual should only be a leftist, seeking social equality if he has some rationally valid argument to be one that does not appeal to a positive qualitative state through equality. If this is his only argument, defending leftism will be for him an irrational action. Now regardless of the reasons that an individual has to defend a political position, such positions are always associated with the search for a better world through the ideas proposed by them. That is, the search for a better world is essential to a political vision and whatever it proposes, it will naturally do so with that purpose. For example, the right-wing view proposes moral and cultural conservatism, as well as the acceptance or even defense of certain inequalities, as means to that end. Liberalism, in turn, proposes to defend the fundamental human rights to life, property, and freedom under the understanding that if humanity lived according to such rights, it would have a better life experience. The quest for a qualitative [more] positive state for living things may not be what goes on in the mind of an ideologist while defending his political position, but these visions in themselves aim for such an objective. They are not like scientific theses, presenting descriptions of how reality is; rather, they are prescriptive, stating how society should be and act in the face of the desirable attainment of a qualitatively superior reality. It is concluded that, being a political view, when leftism preaches that "one must seek/defend/fight for social equality", it does so by proposing that this is the way to a better world. But in doing so, leftism ends up affirming the fallacy of equality, inferring a positive qualitative state (a better world) from equality. It is concluded, then, that the leftist vision is essentially connected to a rationally invalid reasoning and therefore consists of an irrational proposal. That is, once there is no way to affirm leftism without affirming the fallacy of equality, then such a political vision is rationally unacceptable. N1: "Deductive reasoning" is one in which the conclusion will necessarily be true if the premises are true. The same does not proceed with inductive reasoning in which assumptions are provided only to increase the probability of the conclusion. In these cases, being non sequitur does not imply being structurally deficient. N2: A useful analogy for comprehension is to understand the conclusion as a place where one wants to get separated from the present position by a cliff. In this case, an argument is like a bridge connecting both sides. If a bridge there located is broken, this does not automatically mean that there are no other bridges ahead in better conditions and safe for the crossing. N3: Following the example of N2, if there is only one path to the other side of the cliff and this is not feasible, then one must remain in the current position until a new bridge is built. N4: For example, Nelson Goodman seeks to solve the case of the composition fallacy by distinguishing "expansive" an "non-expansive" properties[R9]. Following this suggestion, to argue for the color of a floor without committing the fallacy of composition, one should assert such a distinction as part of the premises. N5: Concerning faith in Jesus for the salvation of sins, the apostle Paul manifested this understanding in 1 Corinthians 15. N6: This justification can be manifested in a number of indirect ways, such as "because we will have a better world", or "because it is fairer", or "because we will all be happier". R1: Fallacy Files. 2017. Glossary. [ONLINE] Available at: http://www.fallacyfiles.org/glossary.html#Argument. [Accessed October 25, 2017]. R2: Internet Encyclopedia of Philosophy. 2017. Fallacies. [ONLINE] Available at: http://www.iep.utm.edu/fallacy/. [Accessed October 25, 2017]. R3: Fallacy Files. 2017. What is a logical fallacy?. [ONLINE] Available at: http://www.fallacyfiles.org/introtof.html. [Accessed October 25, 2017]. R6: Fallacy Files. 2017. The Hitler card. [ONLINE] Available at: http://www.fallacyfiles.org/adnazium.html. [Accessed October 25, 2017]. R7: Wikipedia. 2017. Adolf Hitler and vegetarianism. [ONLINE] Available at: https://en.wikipedia.org/wiki/Adolf_Hitler_and_vegetarianism. [Accessed October 25, 2017]. R8: Fallacy Files. 2017. Appeal to Nature. [ONLINE] Available at: http://www.fallacyfiles.org/adnature.html. [Accessed October 25, 2017]. R9: Fallacy Files. 2017. Composition. [ONLINE] Available at: http://www.fallacyfiles.org/composit.html. [Accessed October 25, 2017]. R10: Reasonable Faith. 2017. What Price Biblical Errancy?. [ONLINE] Available at: http://www.reasonablefaith.org/what-price-biblical-errancy. [Accessed October 25, 2017].